Rebuild a rocket stove hot water heater. Adobe and natural building construction techniques. This 5-day module is only $350 for the week. Cob building combines clay sediment, sand, fiber, and water, and is hand sculpted to form walls, benches, ovens, and fireplaces. Cob building makes use of readily available, affordable, non-toxic materials to build beautiful, organic structures. 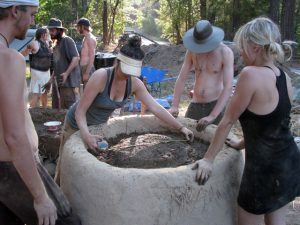 A traditional class project in Permaculture PDCs is the building of a cob “pizza oven” with which the whole crew enjoys the oven’s first meal. Rocket Stoves are a super efficient wood fired masonry stove that is very appropriate for many climates and lifestyles for a comfortable heat source that uses local fuel and doesn’t need an electrical grid connection. Known as the “people’s masonry stove”, RMH’s are simple, affordable to self build, use mostly simple local materials and offer the advantage that they can usually be retrofitted into cabins and small homes with minor structural reinforcing. One can geek out and build precise gometries and special chimney insulation to maximize interior temperatures, allowing fuel to burn completely. The opening in the stove in which the fuel is fed, the chimney on which the cook pot sits and the gaps–around which the gases flow past and around the cookpot–are very carefully sized to control the amount of oxygen mixing with the burning fuel. The stove’s “L” shape or “J” shape contributes to an ideal mixing of the combustion gases for clean burning. It’s all about the proper conditions for complete combustion. Knowing what we know about indoor cooking health, if we can warm a pot of soup with minimal fuel and minimal smoke, can we also create indoor comfort, warming bodies? Imagine turning “urbanite” into stone and cob benches, from which passively radiates gentle warmth. This can pleasantly heat up an entire living space, provide heat in a workshop or even serve to extend the growing season in a nursery or greenhouse. Combining rocket mass heater, Aquaponics and extended greenhouses is a system integration which holds great promise. 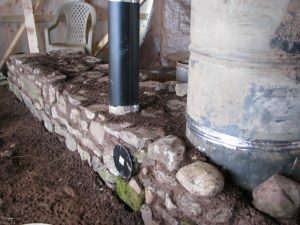 Get your feet and hands muddy in the cob and learning about current trends and techniques in natural building. Join us as we rebuild the Rocket Stove hot water heater and reward yourself after a fun day with a hot shower, powered by the sun. There is now a surge in interest in the construction of wood ovens, shelters, barns, and even entire houses using traditional building methods with locally sourced, sustainably harvested materials. Have you ever heard of the ubiquitous “cob pizza oven” so common at Permaculture PDCs? “Natural building technology“ actually dates back to prehistoric times and incorporates the same or similar materials as used in the construction of some of the oldest shelters still in existence today. “Eco building“ focuses on creating beautiful, environmentally sustainable homes and structures that are created using locally sourced materials harvested from the very site on which that the structure will stand.